Since 1984, Turner & O'Connell, Attorneys at Law, have been serving Harrisburg, Pennsylvania, residents with sound legal advice and guidance. Our primary practice areas are bankruptcy, family law and divorce, real estate and estate administration. The decades of experience offered by our firm benefits you, the client, by knowing that our explanation of your legal options is one based on a variety of cases we've worked on through the years. We can help you understand how you move toward a better future after bankruptcy, and work on the best possible outcome for your home and your vehicle. We are attorneys who do not back down from complex cases. We have the know-how needed in bankruptcy law to bring closure to financial troubles. With divorce, we have both negotiation and litigation skills to help you reach your desired goals. Our lawyers are prepared to work for your best interests. Our probate and estate administration representation seeks to resolve affairs in a timely and cost-effective manner. We also offer estate planning services so you can ensure that your assets are distributed in the way that you intended. 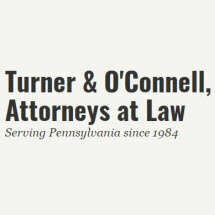 For a free consultation, contact Turner & O'Connell, Attorneys at Law, in Harrisburg at 717-743-1956. We can help you find solutions.